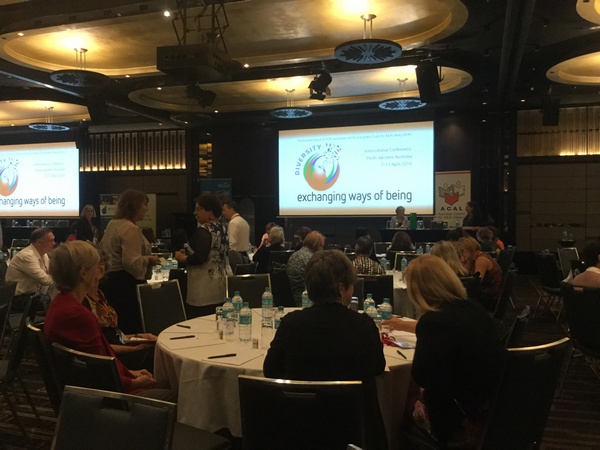 This post contains most of the content from a workshop session on getting started with blogging and its potential with students that I presented at the WA Adult Literacy Council Conference on 17/4/15. Apologies for the length of the post – I just wanted to put all the content in one place! The slides are now uploaded to Slideshare. 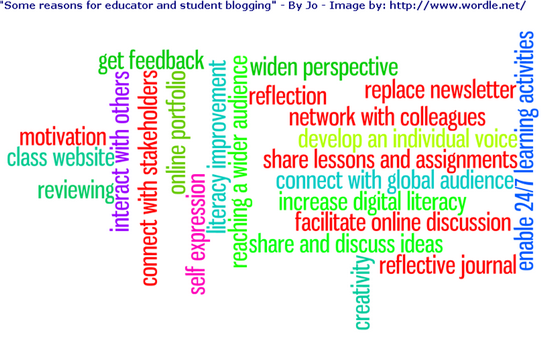 Why should we and our students blog? The mechanics of blogging – getting started. 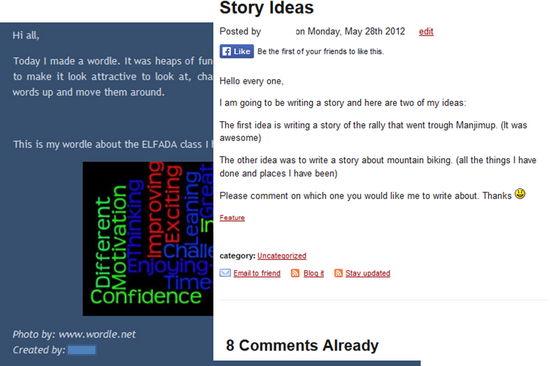 The following images are from student blogs created during completion of Certificates in General Education for Adults. They show some of the evidence gathering activities for which the blogs were used. Make sure you write these down! When you are looking for a theme to change the appearance, be sure that you use a “Mobile friendly” one. Blogs are very individual so what and how you post is very much your own decision, however you might find the following posts helpful in getting started. If you have questions or need help then please comment on this post. A digest of our recent webinars over the last few weeks. From now on time permitting I hope to return to posting a fuller overview or each webinar every week. As sometimes happens one of the topics (password management) generated a lot of interest but none of us had very much knowledge so this became the topic for the following FineFocus with @philhart volunteering to facilitate the session. This week’s fantastic recorded session was a look at the pros and cons of password managers facilitated by @philhart we also shared a variety of links to password managers both cloud-based and downloadable. The discussion on cheap tablets centred mainly around features available and intended purpose. Our look at programs we might use for illustrations sent us as always in search of free ones and the discovery of some that were new to us – this has resulted in a couple of us who participated exploring Inkscape In the remaining time we talked briefly about any e-gadgets new to us we had heard about, “played with” recently or that we wish for! This was a fascinating, and very interactive, recorded session (the first of two – the second part will be on the 13/14 February). In the session @jofrei shared her extensive knowledge of some of the myths about giftedness. 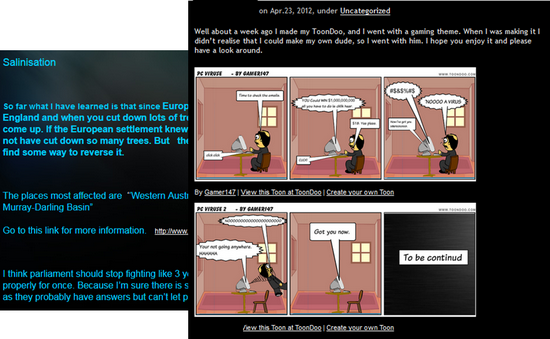 Jo has recently posted a series about busting the myths on “Sprites Site”. We shared some of our recent experiences of using drawing/illustration programs including Inkscape. The discussion on security was mainly about the phishing attempts of the “phone call from “a computer company”” and “email from “your bank”” type that still happen regularly with slightly new twists. Our next webinar will be an Edublogs “FineFocus” session “Columbus Cheetah Myth Buster II” in which @jofrei will continue her story of myths about giftedness. This session is on Thursday Feb 13th at 23:00 GMT/UTC (Afternoon/Evening USA) or Friday Feb 14th at 7am West Aus, later in the morning Eastern States Aus depending on your timezone (check yours here) – in the usual BlackboardCollaborate room. Still running behind on webinar overviews. A digest of our recent webinars over the last few weeks. As always this session was recorded. The session was our last webinar before the Reform Symposium Online Conference #RSCON #RSCON4 and so we decided to provide a further training/practise/question and answer opportunity for presenters/volunteers. In this recorded Serendipity session we talked about the recent Reform Symposium Conference #RSCON #RSCON4. We were a small group and all of us had had some involvement as participants or presenter/volunteer/organiser, so the session provided an opportunity for us to share our thoughts, reflections and ideas. This was another recorded session the intention was a quick tech smackdown type share of some favourite tools/applications that save time or that we use with students but we ended up discussing a variety of: tried and tested tools, some previously used with students and some new that we plan to try. All in all a great session with many shared links. In this recorded Serendipity session our chosen topic was “Blended Learning”. We started with a discussion on our understanding of the term blended learning, moved on to share tools that have been part of our best blended learning experiences, considered some of the advantages, and ended with a brief look at how/why we choose tools and strategies for blended learning. Our next webinar will be an Edublogs “FineFocus” session on Thursday Nov 7th at 23:00 GMT/UTC (Afternoon/Evening USA) or Friday Nov 8th at 7am West Aus, later in the morning Eastern States Aus depending on your timezone (check yours here) – in the usual BlackboardCollaborate room. Where do you get these sites from? This post is a cross-posting from the West Australian Adult Literacy and Numeracy network newsletter, so apologies if you have seen it twice. I wrote it in response to a query on our network of literacy/numeracy practitioners in WA most of whom are quite new to online tools and strategies. This question was posed in response to a recent post by Phil (@philhart) on our Western Australian Adult Literacy and Numeracy (ALaN) network GoogleGroup – Phil shared a site called Visuwords, an online graphical dictionary that gives a visual representation of associations between words. 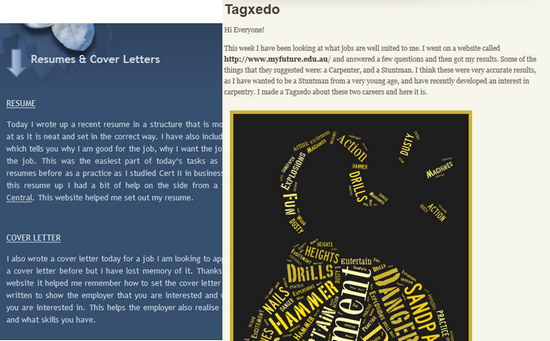 Phil’s answer was that he gets many of these kinds of links via his Personal (Professional) Learning Network (PLN). A PLN is a network of people often, but not always, with similar interests to your own. We all have a PLN of some sort even if it is just the network of colleagues we meet through our daily work. However the most useful and effective PLN is one which extends outside our own day to day physical environment, outside our own specialist teaching area and outside our particular educational sector. My own PLN is global, cross-disciplinary and cross-sectoral. It makes considerable use of social media and online tools in general. 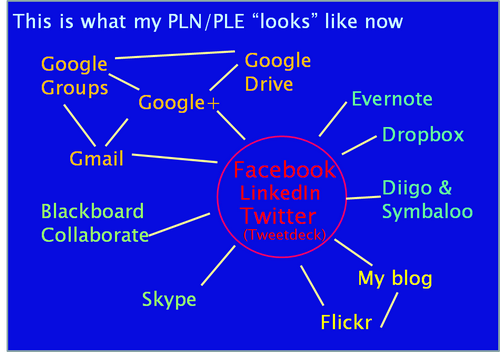 So my Personal Learning Environment (PLE) through which I access my PLN is largely electronic. The main point here is that no two PLN’s are the same! We all have our own preferred balance of people and communication environments/strategies. Mine (like most others) has evolved over time and now looks something like the diagram below. I expect that my PLN will continue to change and evolve – I currently use a variety of platforms so that I don’t miss out on posts from people for whom I have enormous professional respect but who don’t use my preferred platform for the majority of their interactions. Start with one social media platform – find a mentor on that platform who is very experienced and has a medium to large network of their own. Be social, be human – the social interactions are important despite the derision you see levelled at some platforms regarding the triviality of some posts, social interaction – the personal relationship “oils the wheels” of the professional relationship. I do check out profiles before I connect back (because like all online contexts there are plenty of “black hats” out there) although if I already know you from another context I may not. I will usually connect back within a few days. Sharing, sharing and sharing again! Some members of my own PLN have become good friends without us ever meeting! When chance gives us opportunities to meet there is none of the awkwardness of strangers meeting for the first time. This is a huge benefit for me as, despite my advanced age and years of teaching, I am quite shy when meeting strangers. For more ideas about PLNs checkout this post “What the heck is a PLN?” by a West Australian teacher with a global presence who is part of my PLN and is now a good “real face-to-face” friend that I first “met” online via Twitter. For me personally the global nature of my own PLN and the opportunity to be involved in learning from such a diverse group are the “icing on the cake”! I have been immeasurably enriched by many people in my own PLN and can only hope that I am able to “pay this forward” in some way.